San Antonio Creek is, these days, more commonly called Oakland Estuary, or just the Oakland Inner Harbor. The northeast shore of Alameda also drains into San Antonio Creek. 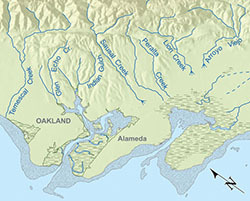 But, because Alameda is built on a sand dune, the soil is so porous that there were never any creeks in Alameda. 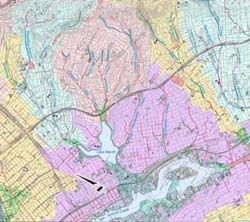 The historic portions of West Oakland are also built on a dune and were devoid of creeks.